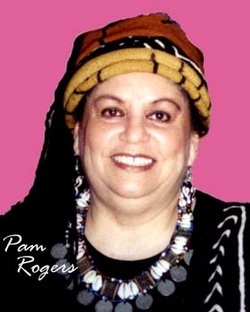 Pam Rogers inherited her love of singing from her parents at an early age; the family sang together. She learned to love the harmonies singing Latin Masses and Gregorian chants in the elementary school choir. Her Singing continued in high school and in various church choirs until 1984, when she came to In Process… Pam is a talented songwriter and arranger and hopes her songs of testimonies of her own life experiences encourage others. In 2001 she joined with other four songwriters in the Between Friends project to record and perform some of their original compositions. Pam loves bringing together a theme and great singers. With her sister, Paula Pree, she co-directs a church music program. She has produced and coordinated many Civil Rights programs for the Smithsonian Institution American History Museum, Program in African American Culture.